Is it just me, or is this winter never going to end? But seriously. Okay, I realize that it’s still just February, but I’ve been getting that itch for spring lately like crazy. I think it’s all the transition on the horizon for us, which is so scary, but so exciting. Ryan and I made a judgment call the other day. While we’d love to live off post in Washington, the housing market there is awful in terms of rentals right now. 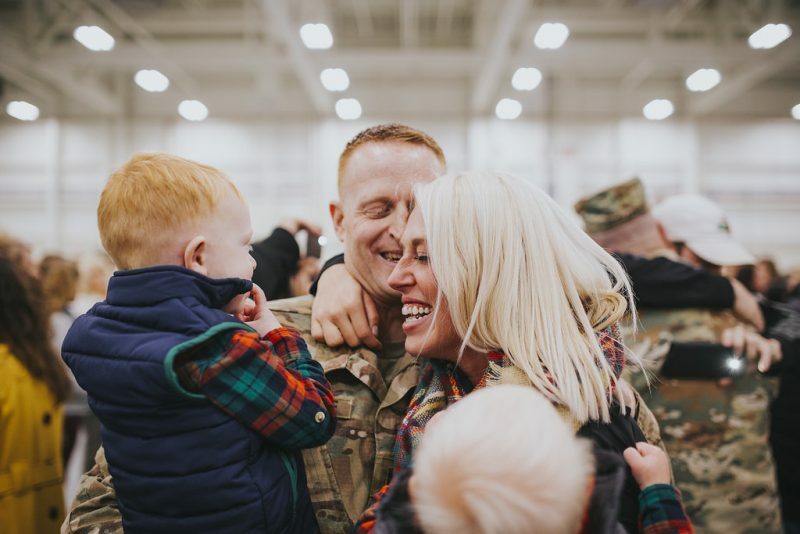 From what we’ve seen and heard from those already stationed there, houses are snatched up within hours of being listed, which really provides no wiggle room. Furthermore, for the type of house we want to rent, we’re looking just above Ryan’s BAH (basic allowance for housing), and we’re not sure we want to go that route just yet. So, despite my desire to live off post, we’ve sent in our paperwork to apply for housing on post. Since Ryan will work on main post, we’ve decided that (barring my getting a job in Seattle/Tacoma), we’re going to live on post and assume I’ll still be working from home – either with my current company, or for another company. You might remember it’s kind of up in the air from this post, but I do have some prospects on the horizon, so please cross those fingers for me! Since I’m still slated to work from home though, I’ve been dreaming of how to make this office mine. Today, I’m linking up with Momfessional for Friday Favorites and Smidge of This for Five on Friday to share my top home office inspo. 1 // Mixed Woods and Whites. 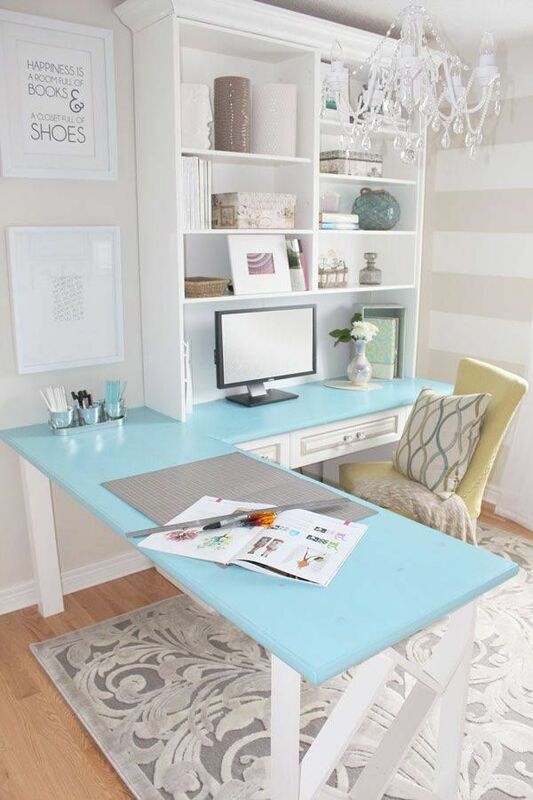 I love the idea of keeping my office bright and clean, but with plenty of workable space. In our current home, I don’t actually have a dedicated office, which we knew when we moved in. I work in a corner of our living room. It hasn’t been bad, but it’s crowded, and I’m ready for space. 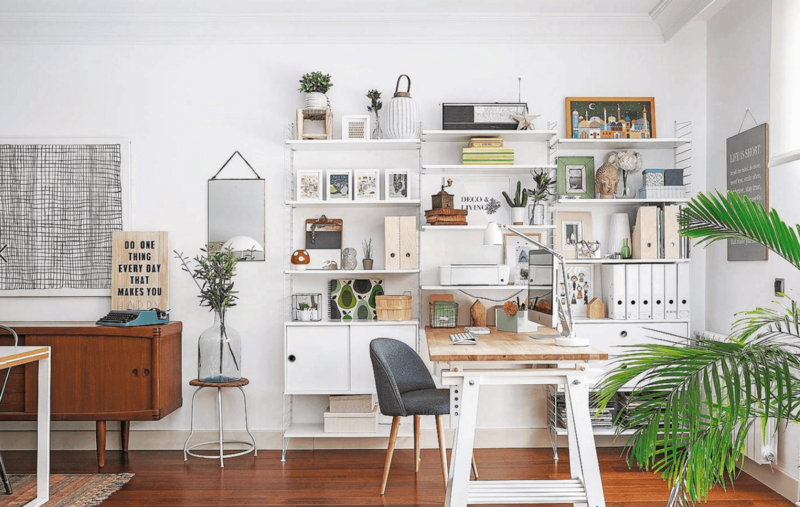 I love a space that offers shelving for storage and inspiration, plus a lot of places to move and create…I am a writer, after all. 2 // A Pop of Color. I’ve never been a girly girl. Okay, that’s a lie. I was a girly girl when I was younger. Over time, I’ve come to love practicality over girlish things though. What I love about this idea is that it adds a pop of fun color, which marries the need for space with the desire for something aesthetically pleasing. Plus, it’s more feminine than the dark woods I usually go for, which I love. 3 // Let in the Light. As most of you probably know, it rains a lot in Washington. Like, a lot. We’re moving to Western Washington, too, so we’re looking at more gray days than I’d love. My goal is to bring as much light and brightness into the space as possible. I think that a bright, happy place inspires, and that’s what I hope to go for above all else. White might not be the best idea with two little boys, but bright definitely is! 4 // Function & Form Above All Else. As a mother of two little boys, I know they’ll inevitably make their way into my office at some point. Because of this, I really want to make sure there’s a corner of the space that’s dedicated to their needs. Crazy, right? Not really. I figure that if I take the time to make something that’s fun for them, they’ll be occupied there, and they’ll be uninterested in the cords and computers they could destroy. I love the idea of a chalkboard area where they can create while Mommy’s working. 5 // Keep it Simple and Straightforward. I’ve mentioned before that I’m fascinated by the concept of minimalism. Look, let’s be honest. I’ll never be a minimalist. I like things. I also like order though, and I love the idea of marrying simplicity with chic. Will it be as empty as the picture below? No. 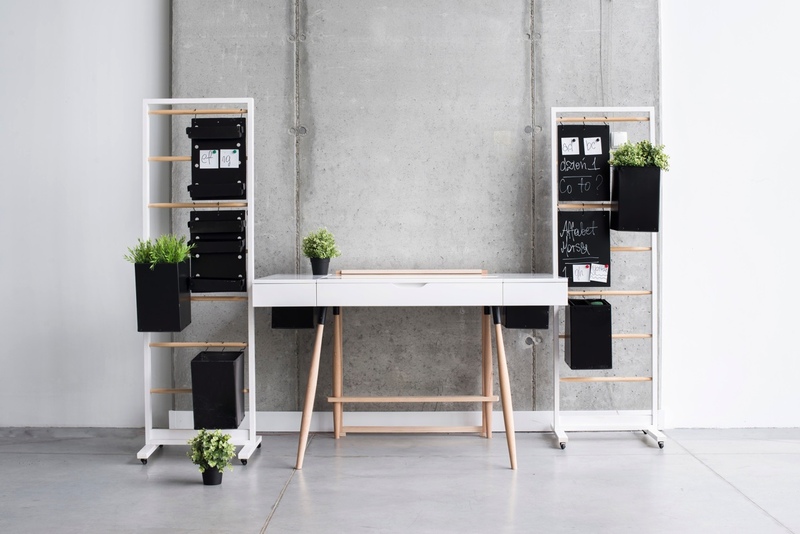 Will it offer less clutter and more room to breathe, be inspired, and work? Heck yeah! I also love the stark contrast between black and white. Is that weird? Having a dedicated office is one of the most exciting parts of this move for me. As of right now, I’m still going to be working from home, so that means I need space to breathe and create. 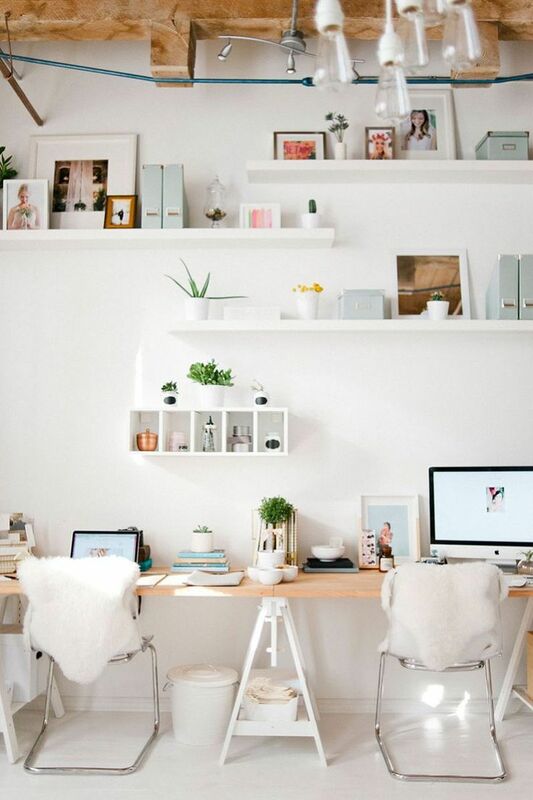 I’m hopeful that we’ll be able to make a fun, inspiring, and beautiful home office – finally!